NEW YORK (AP) — The official line is "we'll see." But the Rolling Stones seem in such fighting trim, clear-eyed and focused, that it's hard to believe there's not more cooking beyond the current flurry of activity surrounding the band's 50th anniversary. The archetypal rock 'n' roll band is booked for five concerts in London and the New York area over the next month, the last one a Pay Per View event. The Stones on Tuesday released yet another hits compilation with two new songs and HBO is premiering a documentary on their formative years, "Crossfire Hurricane," on Thursday. "Without saying yes or nay," Keith Richards said in an interview this week, "once this starts rolling, I can't see it stopping. The band feels good about themselves, they still feel they've got something to offer. Obviously there are a lot of people out there who agree. We'll go along with it." Fifty years is hard to fathom ("It's impossible," Keith cackles. "I'm only 38."). The Rolling Stones have been through death, defections and addictions, through classic discs like "Exile on Main Street" and "Some Girls" and forgettable ones, and are still operating with Richards, Mick Jagger and Charlie Watts. Ron Wood, the new guy, joined in 1975. "I thought it would be kind of churlish not to do something," Jagger said. "Otherwise, the BBC would have done a rather dull film about the Rolling Stones." Fifty days was a better yardstick when Watts first set up his drum kit. "It was quite normal for a band to last a month," he said. The Stones formed in London in 1962 to play Chicago blues, led at the time by the late Brian Jones and pianist Ian Stewart, with boyhood friends Jagger and Richards. Bassist Bill Wyman and Watts were quick additions. Anniversaries usually aren't big on the band's agenda, but Richards said the Rolling Stones felt external pressure to mark this one. "This band is famous for not obeying the rules and bowing to pressure or anything," Richards said. "But over the course of the year we felt more and more aware that there are folks out there counting on us. You can't let them down. At the same time, you realize that the folks are right. Playing together over the last five months you realize that there's this thing out of your life that's been missing." They spent several weeks in Paris rehearsing five hours a day for their concerts, including two dress rehearsals before audiences in a club and theater. To mark the occasion, the band has dug back into its catalogue for songs like "I Wanna Be Your Man" and "The Last Time," although Richards held the line at resurrecting their first single, the Chuck Berry cover "Come On." Jagger didn't want the band to take on too much, "but I thought it was important to do some sort of a show, even if it was just a club gig," he said. "I didn't want it to be too nostalgic and I wanted to be pretty irreverent about it. My idea of the tour is calling it 'F--- Off, We're 50.'" Few people in the concert industry expect the Stones to mount one of the huge world tours that they have done in the past, given ages that range from Wood's 65 to Watts' 71, said Gary Bongiovanni, editor and publisher of the trade publication Pollstar. More live shows wouldn't be a surprise, however, perhaps as residencies in a number of large cities, he said. The band's periodic sabbaticals sometimes stretch so long that Rolling Stones fans can't help but wonder whether it's all over now. The most recent time out lasted five years. If anyone threatened to make it permanent it was Richards, always the most protective and romantic about the band, because of his best-selling autobiography that took some shots at his songwriting partner Jagger. Richards dismissed the idea that it created a barrier. "Anybody who thinks that doesn't know the band," he said. "This band's sense of humor is basically built upon insulting each other. I'm not saying there wasn't an issue here and there, but it's really water off a duck's back ... You cannot offend a really good friend. I happened to put it in print and everybody else was saying, 'Oh, my God.' I thought it was fairly mild." Wood is often the diplomat if things get rough between Jagger and Richards. "I still feel that necessary sometimes," he said. "They're getting along so much better than I don't have to be the referee or the adjudicator." Wood said he's pleased with how the band has shaken off the rust. As Richards' fellow guitarist, he sees his role as keeping the band tight, and said the Stones have a greater economy in their playing than they used to, getting to the essence of the songs. "You give Mick a song and have a good beat to it, he can entertain anyone," Watts said. "He's the best in the world at it. Now that Michael Jackson's dead and James Brown is gone, he's the best in the world." Jagger was a driving force as co-producer of "Crossfire Hurricane." The film focuses on the rise and classic years of the Rolling Stones, back when their shows were considered dangerous and not an institution that you'd take the whole family to see. Footage shows concerts cut short when enthusiastic fans rushed the stage and made it impossible to play. "We were playing pop songs to 10-year-olds," Jagger said. "It was very weird. You get used to it in 10 minutes, it's not that difficult. It's much easier to play three pop songs to teenagers than two hours of blues music to connoisseurs." 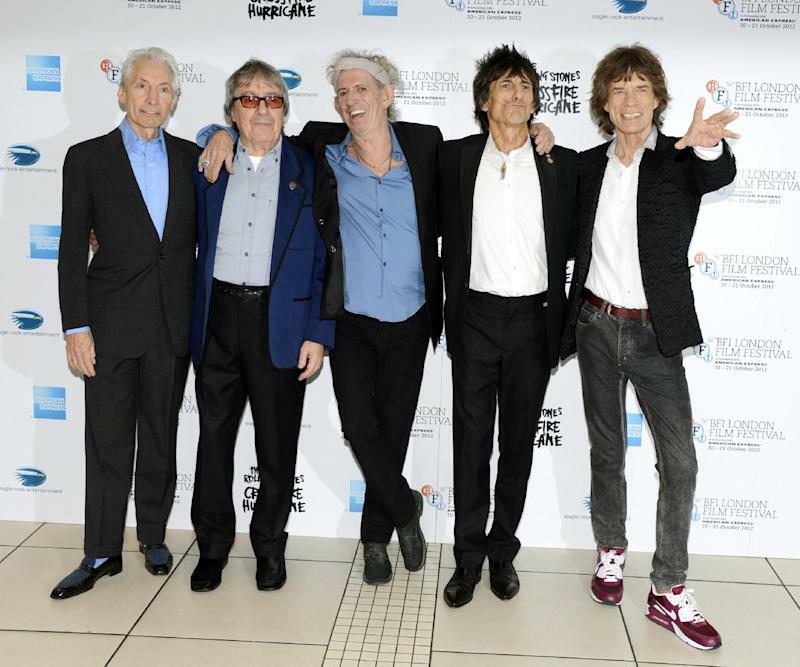 The film contains interviews from all Stones, including former members Bill Wyman and Mick Taylor. None are seen as they are today; Jagger wanted to keep the emphasis on the era and not go back and forth between the past and present. For his part, Richard said he barely remembers the cameraman being there for all the backstage scenes. "I'm crashed out in the dressing room with some babe with me," he said. From the looks of things, he's fortunate to remember anything. The thin, dissolute rocker has given way to a character that children often point to on the streets, recognizing him as Captain Teague, father of Johnny Depp's Jack Sparrow in the "Pirates of the Caribbean" movies. The parents will tell them: "Oh yeah, he's also in the Stones," Richards said, laughing.